Amanda Denton suffered a severe brain injury in May 2014. Her struggle for rehabilitation was vigorously supported and well documented by her partner Tommy on “The Help Amanda Denton Get Rehabilitation Page” on Facebook. Sadly, Amanda passed away last Saturday. Hundreds of expressions of sympathy from people around the world have been sent to Tommy over the last couple of days. It will not take away the terrible sense of loss Tommy must be feeling but the knowledge that there are so many people thinking of him and Amanda might give him the bit of extra strength that he will need to get him through these difficult times. Both Amanda and Tommy have been great fighters. 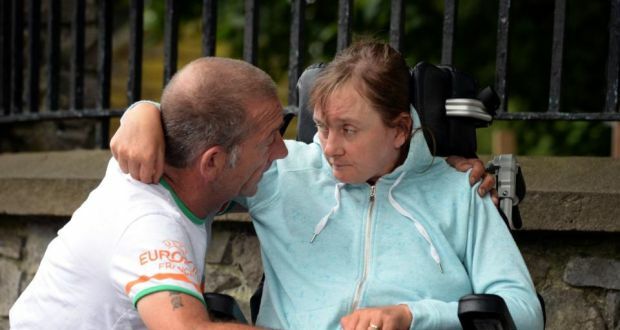 I am sure that Amanda will never really leave Tommy’s side and will be there with him, supporting his struggle to make proper and adequate neurological rehabilitation for those suffering a severe acquired brain injury in Ireland a reality. Thank you for sharing this. I know the void in Amanda Denton’s husband’s life will be a travesty for him but I hope over time fond memories will replace sadness and her spirit will give him the inspiration to fight for the rights of those who sustain traumatic/serious brain injury the rehabilitation and support systems they need and deserve as members of our human family.